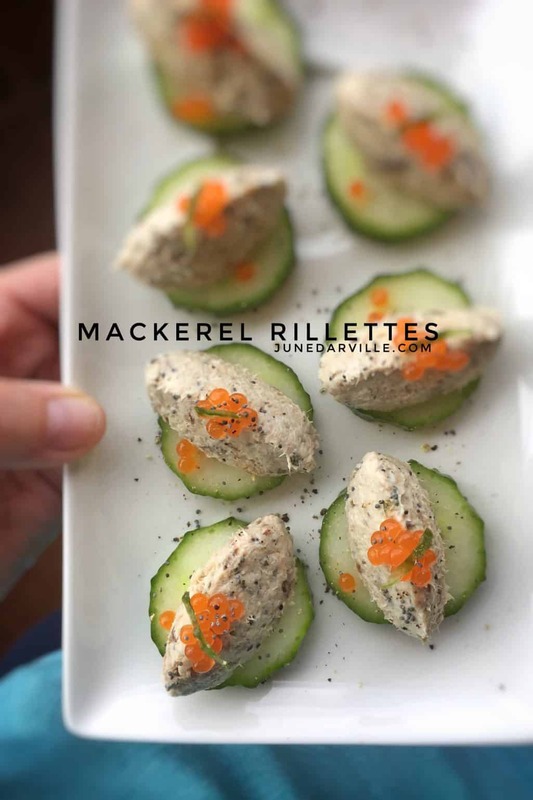 Mackerel Rillettes Appetizers | Simple. Tasty. Good. I love fish dips because they are so simple. And easy. And quick! These mackerel rillettes for instance only take a couple of minutes to prepare. Nothing more to it! I like to serve them for lunch on a piece of toast. Or as a surprising appetizer dip! I can assure you that this mackerel dip recipe will be a great hit on your next party. You can of course use any other kind of canned fish! I made a creamy canned salmon and tomato spread before. Boy that one was an instant hit. Check it out as well! Watch my video of how I’m preparing these simple mackerel rillettes in my fabulous KitchenAid Stand Mixer Mini! If you don’t have a stand mixer, then I recommend to mash up the mackerel and the rest of the ingredients with a fork because that will make this delicious dip chunkier. If you are looking for a more creamier version however, better prepare the mackerel rillettes in a blender. Here’s a great presentation idea then: I like to rinse the empty fish tins with hot water and soap because you want to get rid of the oil, then dry it. Then scoop the finished mackerel rillettes back into the tins! fancy because that gives this dip a more rustic appearance. And it saves you another bowl or plate you don’t have to wash up later on. Or go for some finger food like I did: slice a cucumber (not too thin or too thick, you have to be able to hold the appetizer like a cracker), then make little quenelles using 2 teaspoons, place the fish quenelles on top of the sliced cucumber and finish with whatever garnish you have around. Herbs, pink pepper, poppy seeds… or salmon eggs like I did. It’s entirely up to you! 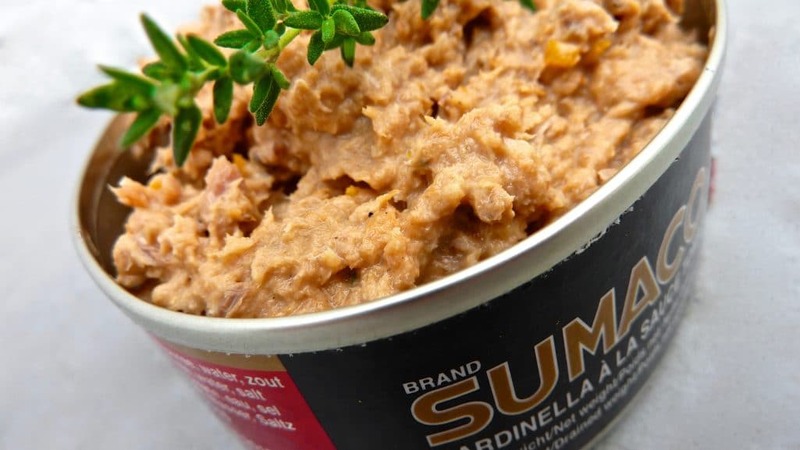 Looking for another canned fish appetizer? Then take a look at my popular mackerel crepe rollups! Fond of mackerel? Then do check out this beauty I’m so proud of: smoked mackerel with lentils, sour cream, watercress and a poached egg! De-lish, outstanding and super posh but so easy to make! Enjoy! Try out these very easy mackerel rillettes with cream cheese and poppy seeds! Place little quenelles on cucumber, great finger food! If you don’t have a stand mixer, then I recommend to mash up the mackerel and the rest of the ingredients with a fork because that will make this delicious dip chunkier. If you are looking for a more creamier version however, then you better prepare the mackerel rillettes in a blender. Add all the ingredients to the bowl of the KitchenAid Stand Mixer Mini and season with a pinch of pepper and salt to taste. Attach the flat beater and lower the mixer head. Set speed 3 and mix the ingredients for 2 minutes. Scrape down the sides of the mixer bowl. Set speed 4 and mix the ingredients for 3 minutes. Let the rillettes cool in the fridge for 30 minutes. Serve as a sandwich spread or and an appetizer. This recipe for a sardine spread always comes in handy because if I have unexpected visitors stopping by or if I’m in desperate need of a quick lunch idea then I can always rely on canned fish! I always keep a couple of tins of different types of fish in my pantry (they also taste great in pasta recipes as well) because there are always those ‘oh cr*p’ moments when I run out of any cheese or charcuterie when making lunch. Canned fish, drizzle of olive oil and vinegar, done! But like I said canned fish can also serve as a quick and easy appetizer dip! The combination between the sardines, the strong mustard and the fresh orange zest is quite spectacular I must say. A very surprising flavor explosion! I used canned sardines in tomato sauce for this one but sardines in oil will also do. Sardine spread: an orange flavored sardine dip as an appetizer or for your lunch sandwiches: you decide then! Remove the canned sardines from their tin (you can rinse the tin and keep it to serve the spread in later) and put them on a large or deep plate. Mash the sardines up roughly with a fork. Then add the mayo and strong mustard to the sardine mash. Season with a little pinch of pepper and salt to taste. Mix and stir all the ingredients until you get a chunky paste. Don’t mash it up too finely. Then add the chopped or grated orange zest, the white wine vinegar and the chopped fresh or dried thyme. Stir the sardine mash well again. Then add the tomato paste. Stir well until all the ingredients are well combined. Check the seasoning of the sardine dip and add extra pepper, mustard or salt to taste if necessary. Transfer the spread to a small serving bowl or fill the rinsed sardine tin with the fish dip. Keep the sardine spread at room temperature because the flavor will be less explosive if it's cold. Serve with crackers or nachos.